4 day combo tour through the Namha National Park - Trekking in Luang Namtha, Laos - Hiking, Kayaking, Cycling, Village Tours - Discovering Laos! 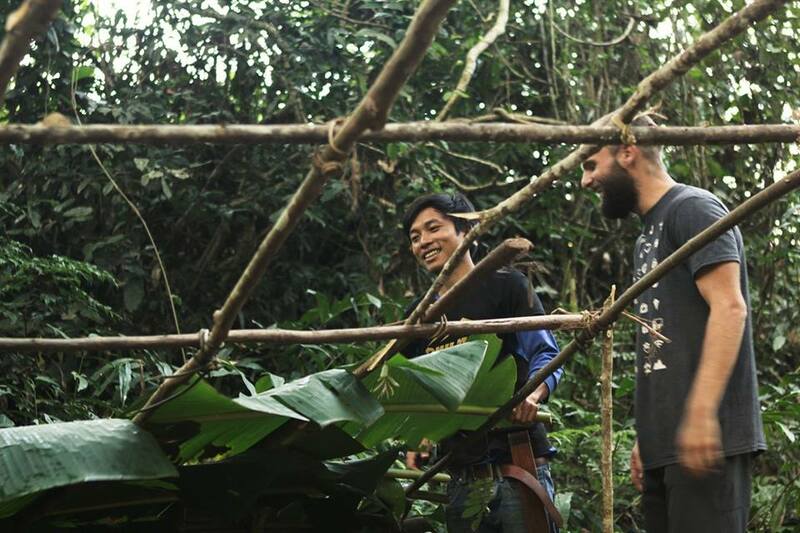 Enjoy authentic Lao food prepared by your guides using the resources of the jungle and traditional bushcraft methods. Feast your eyes upon awe-inspiring views across the hills and valleys of Namha NPA – cameras at the ready! ​We meet at the Discovering Laos office for 9:00am and take a tuk-tuk ride to the heart of Namha NPA at Doi Luk Kham, stopping off on the way for supplies at the local Lao market. 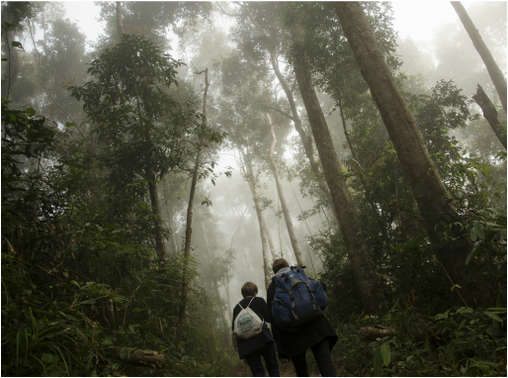 Once we arrive we begin trekking on a trail that ascends high into the hills and deep into wild tropical forest. At lunchtime we stop at a perfect spot in jungle for a well-earned Lao picnic, expertly prepared by our guides using the resources of the surrounding environment. We continue on the trail through a hugely impressive tropical forest filled with mighty mahogany trees, bamboo groves and wild banana plants. 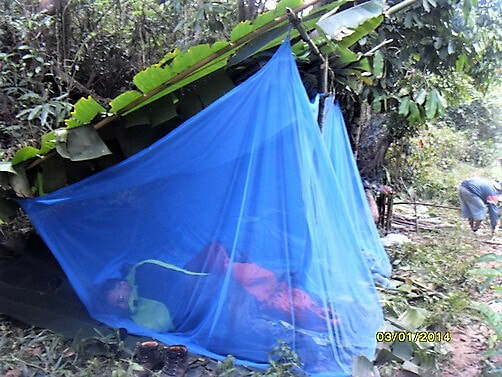 After finding a suitable campsite our guides will teach you how to construct your own banana leaf shelter for the night, and how to select and find the right building materials. Relax, enjoy dinner and drinks by the campfire, and later fall asleep to the enchanting sounds of the jungle. ​Wake up to the enchanting sounds of the jungle with a delicious and authentic Lao breakfast. At around 10.00am we begin hiking through old-growth forest, totally immersed in the wild natural landscape as the trail leads us over rugged hills and across verdant valleys, all the while shaded from the sun by the canopies of tall and ancient trees. We stop at a suitably scenic location in the depths of the forest to enjoy an authentic picnic - Lao style! After lunch we continue hiking on the trail through old-growth forest, eventually reaching an oasis of cultivated land comprising rice paddies, banana trees and fields of tall slender grasses. Soon after, we reach the remote Nalan village, a timeless refuge at the heart of the jungle preserving the unique culture of the Khmu people. After getting acquainted with the local tribespeople take time to enjoy the sanctuary of the village; take a rest, go swimming in the river or explore the local area. After devouring a delicious dinner, laid on by your homestay hosts, enjoy an evening drink with the locals or retire straight to your comfortable sleeping quarters at the home of our village hosts. After meeting the local people of Nalan village, we continue on the trail. 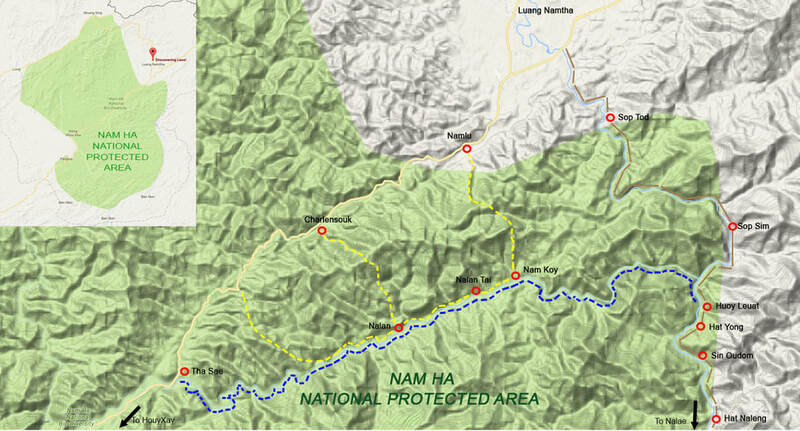 Hiking alongside the gorgeous Namha river there are stunning views stretching for miles along the river valley. A few kilometers further on we soon reach the village of Nalan Tai , the northern sister village of Nalan. After a delicious dinner, laid on by our guides, enjoy a few drinks with the locals or retire early to bed in the comfort of the purpose made eco-lodge. ​Wake up to the sound of village life with a tasty Lao breakfast and hot drink. At 10:00am, it's time for your water adventure! Following basic instructions on paddling techniques and safety, we begin paddling downriver, easing ourselves into the day with a couple of short visits to Khmu riverside villages. Soon after we find ourselves paddling through a dramatic cascade of roaring rapids. 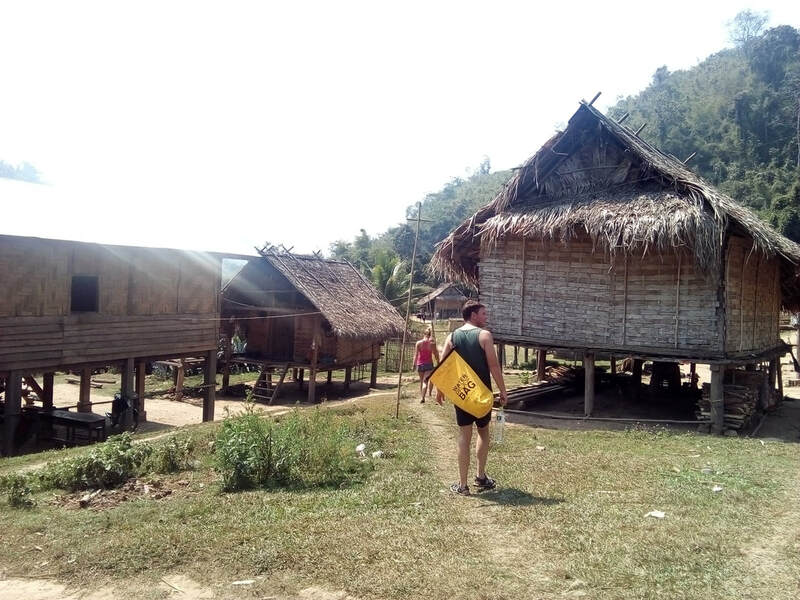 Around lunchtime we find a calm stretch of water and stop at a scenic spot for another delicious Lao picnic. We continue paddling downriver; the stunning beauty of the Namha landscape opens before us, as stretches of calm water offer the chance to spot tropical birds and aquatic wildlife. Before long the current grows in strength. We speed through a series of rapids and fast-flowing channels before joining the mighty Namtha river. By 4:00pm we reach Houay Leuat village, our place to stay for the night. Meet the locals, explore the surrounding area and take a refreshing dip in the river. At 7.00pm our guides will have prepared and be ready to serve an authentic Lao dinner. Later that night, depending on your chosen experience, drift to sleep in our eco-lodge, or village family homestay, to the sounds of the jungle and village life. ​Wake up to a Lao breakfast and drinks, freshly prepared by our ever-attentive guides. 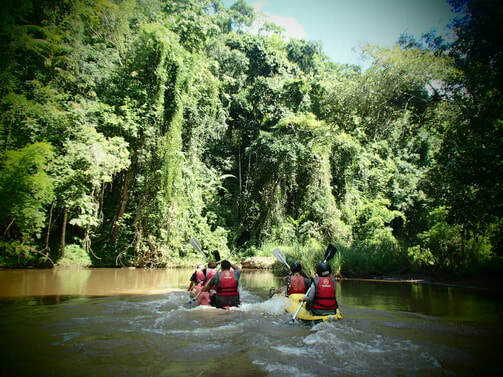 At 10:00am we start paddling downriver past a rustic landscape carved into a rich mosaic of cultivated jungles. After stopping off to visit a couple of quaint Khmu villages we find a perfect location on the river for a lunchtime picnic. Back on the river, leaving behind the rice paddies and cultivated jungles, the river suddenly widens and the steep hills rising above become dense with lush tropical forest. Soon after we are tackling a dizzying number of exciting rapids, before reaching Hat Naleng village and the end of our river adventure. A tuk-tuk awaits out arrival and drops us off at the Discovering Laos office for approximately 5:00pm. The price ranges from $132/person (USD) for 8+ Pax to $434/person (USD) for 1 Pax. Note: Warm clothes for the evening and night is advisable during the winter, between Oct-March and especially to change into for the tuk-tuk ride back to the office after kayaking. We will respond within 24 hours by email after clicking Submit or swiftly via WhatsApp. Thank you, speak soon!